Le Bouchon Breton, claim the owners, is the restaurant that London has been waiting for. If they mean the city is desperate for a proper, bustling, giant, rollicking, open all day Parisian-style brasserie, dispensing everything from breakfast croissants to good steak frites, from silvery pyramids of fruits de mer at lunch to warming balloons of Armagnac at midnight, then they are damn well right. Patrolling the dawn-to-dusk axis on the capital beat, you will find nothing that even comes close. How I ache for the unpretentious bustle of just such a mythical place; for the prompt quietude of a professional waiter in a long white apron delivering a soft centred herb omelette and a glass of wine in the dull, dead hours of the afternoon. Or the kind of brisk but cheerful breakfast that makes the start of the day bearable. We have the Wolseley, one supposes. It is certainly open all hours. Mind you, with the rents being what they are in Piccadilly, no restaurant of such a size could afford to close for a nanosecond! Yet many civilians find it hard to face the massed ranks of the fooderati, clearly feeling pleased with themselves as they dig into Wolseley crumpets and porridge at 8am. Witnessing Andrew Lloyd Webber tackling his breakfast egg? Surely a spectacle that only the strong of stomach could bear. Le Bouchon Breton is another giant - a 160-seat French brasserie, complete with a 40-seat champagne and shellfish bar, that has just landed in east London. Situated in the beautifully renovated Spitalfields Market, it is the brainchild of the heavyweight team behind Les Bouchons Bordelais, a popular bistro south of the river. Key people are ex-broker Ian Stoppani and head chef Nicolas Laridan (ex Le Gavroche). Former Gavroche sommelier Francois Bertrand has put together a wine list of over 700 bins and is also the new restaurant manager. Michel Roux Jnr has acted as advisor. What could possibly go wrong, I wonder, with such talented people behind such a well-intentioned venture? First things first. Up on the first floor of the new Spitalfields development, Le Bouchon looks from the outside like the kind of multi-stacked Portakabins that masquerade as temporary restaurants on racecourses. Inside however, it is pretty wonderful. Designed in belle époque style, it has a black and white floor, a pitched glass roof and huge pewter bar spinning away down its length. 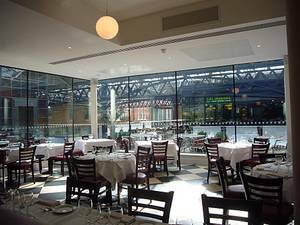 There is a pleasing sense of space and style, elements infrequently found in London restaurants. All the red leather banquettes, polished wood and crisp white tablecloths you would expect in a classic brasserie are present and correct. On the day we visit, a server is fastidiously labelling cheese in the trolley, which emits a reassuring olfactory blast of the barnyard as it trundles by. Glasses of champagne are brimming on the bar and the owner is handing out deep fried snacks such as prawns and chorizo wrapped in filo pastry. ‘Just the thing to have with one or 17 drinks,’ he says. It is important to note that the menu presses all the right brasserie buttons. Everything that should be there is there, from crustacean and oyster sections, to a list dedicated to terrines and charcuterie, to sections that focus on fish, grills and les casse-croutes. But here is the thing. Everything we order is terrible. Two terrines, one salad, one steak tartare, one steak frites, one choucroute and one bottle of overpriced underwhelming wine. All awful. A terrine de gibier is bland, without a whiff of game about it. It is also curiously fatty. It comes with satisfyingly savoury cubes of jelly and a lazy hurl of salad leaves. The terrine de campagne is advertised on the menu as the restaurant’s ‘very own’ which seems to suggest that the others on the list are not. It tastes strange, but is better than the game one. A tomato and French bean salad looks pretty and even features skinned tomatoes (Lloyd Webber will be pleased; he goes on the warpath if he sees a red skin). However, the salad is served fridge cold. The only discernible taste is the cheap oil used to dress it. It is not good value for six quid, plus service. 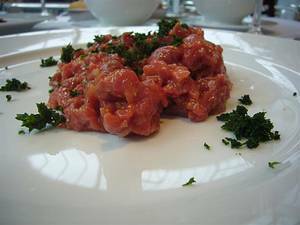 Steak tartare is mixed at the table by a waiter. It is always good to see this kind of service and expertise being displayed in a restaurant, but the problem is the dish tastes of….nothing and, again, it is served too cold. We wait for it to warm up a little but even then, the meat is as tasteless as a wet flannel. 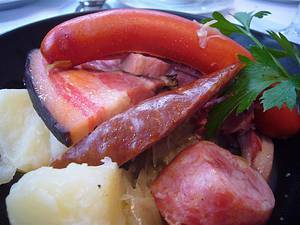 It is always exciting to see choucroute on a menu, but Le Bouchon Breton’s version? Oh my giddy goutbuster, what a let down. The meats all have a neon tinge to them – do they glow in the dark? Shocking pink sausages? What corner of hell were they dragged out of? There is no cohesion, with the ingredients only just introduced to each other instead of enjoying a nice long simmer together. If you look closely in our photograph you can see that they are all sweating – just like S when he thought he had to eat some more of it. The steak frites features a piece of rib eye that has been horribly cooked – was the grill not hot enough? - although at least the chips were real, not extruded. The wine list features an impressive list of mark ups, including our Beaune de Chateau Domaine Bouchard Pere et Fils 2005 (£60) which is totally bland, like everything else we try here. Curioser and curioser. No professional would taste this wine and put it on a list at £60. Although a special mention must be made for our charming, efficient young sommelier, Le Bouchon Breton falls down at almost every major hurdle. The food needs attention and it is far too early in the game for them to be taking customers for granted in the way that they are. ‘Is everything all right?’ asks a waitress as the last of our barely touched plates is cleared away. No, it is not. It most definitely is not.